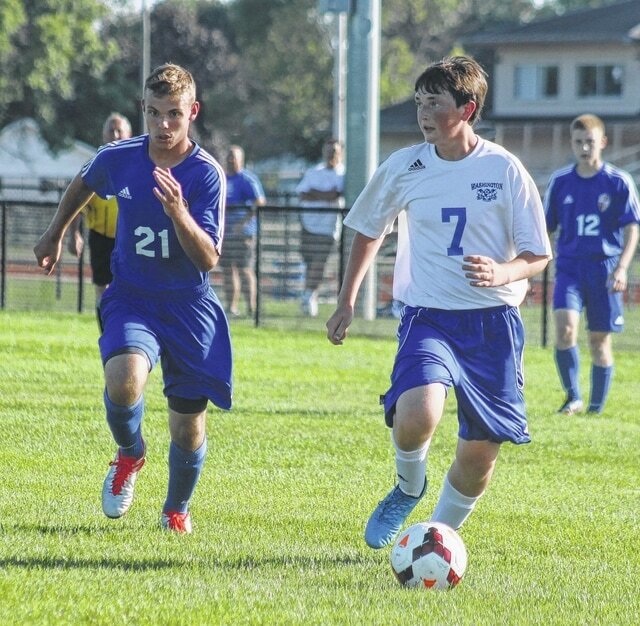 Washington’s Max Schroeder (7) moves the ball toward the goal for the Blue Lions during an SCOL match, their home opener, at Washington High School Tuesday, Aug. 23, 2016. The Washington Blue Lion soccer team held its home-opening match Tuesday against the Falcons of Clinton-Massie. Washington won this SCOL match, 6-1 to improve to 1-1 on the season, 1-1 in the SCOL. The Blue Lions took a 3-0 lead and held a 3-1 lead at the half. Washington out-scored Massie, 3-0 in the second half of play. Blaise Tayese scored the hat-trick (three goals) in the first half for the Blue Lions. Assists went to Jordan Behm, Jack Luebbe and Max Schroeder. Seth Hanusik scored early in the second half for the Blue Lions. That was an unassisted goal. Eli Ruth scored the fifth goal for the Blue Lions (with the assist to Luebbe) and Max Schroeder scored the sixth and what proved to be final goal of the match. “We had our moments when we were a sloppy team, not playing as fast and as precise as I would like,” Washington head coach Aaron Teter said. “But, we have a lot of guys who have good, individual skills. We kind of fought our way through the troubles and scored a good amount of goals. Washington goalie Brian Wilson had six saves. The Blue Lions had 22 shots to eight for the Falcons. The Blue Lions are off now until Tuesday when they will host Leesburg Fairfield. Washington will return to SCOL play Thursday, Sept. 1 at Hillsboro. The Blue Lions opened the season on Friday with a 3-0 loss to defending SCOL champs Chillicothe.